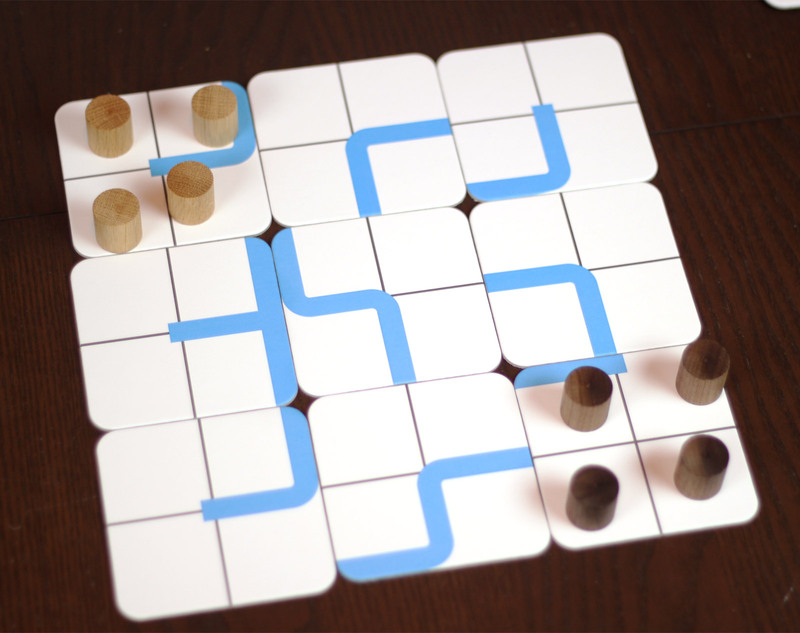 Less is played on a 3×3 grid of tiles, each tile having a 2×2 grid inscribed on it along with a random assortment of blue “walls.” Each player has four pawns that start on opposite corners, and the goal of the game is to get your pawns to the other player’s corner first. You alternate turns, with each player getting 3 points for movement. You can move a pawn to an adjacent empty space for one point; you can also jump over another pawn for one point. (No diagonals, please). If you want to move past a single blue wall, it’ll cost you two points, and jumping a double wall costs all 3. You cannot jump another pawn and a wall in the same move, but you can jump over either your own pawns or your opponents, as long as there is an empty space to land in. And that’s really it; there is a point scoring system wherein you score a point for each move less than your opponent it took to reach the end. (Since white always goes first, brown can still win if they take fewer moves overall. For example, if white reaches the end using all three moves on their last turn, brown gets another turn to finish up – if they can do it in two moves or fewer, they win the points!). The rules aren’t particularly clear on the point, but I suppose if you’re playing multiple rounds you can keep track of points to see who wins overall, or something. You can also play a four player variant with two copies of the game, with a 4×4 grid of tiles, and both players on a team have to reach the goal to win. (On Kickstarter you can get a “double pack” with pawns of different sizes, to differentiate between players on the same team. I don’t know how this will work in retail, if at all). 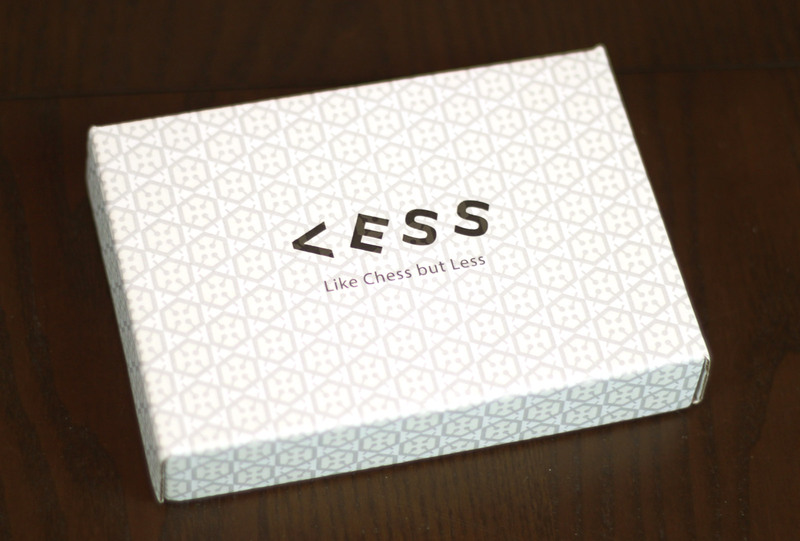 Though the tagline is “Like Chess but Less,” it’s really a lot more like Checkers but less. Or rather, Chinese Checkers. I assume you read the rules and recognized some of the similarities; jumping over pawns, reaching your opponent’s starting zone. “Less” is still accurate here, because it’s simplified and shortened, albeit with a few extra tricks thrown in. I don’t think it’s trying to be the most strategic game since Go, and that’s all right. I believe what it’s trying to be is a small game you can easily whip out just about anywhere, throw down a few tiles, and play really quickly. And in that it succeeds; a game, setup and all, takes about ten minutes, and it’s easily engaging for the duration. 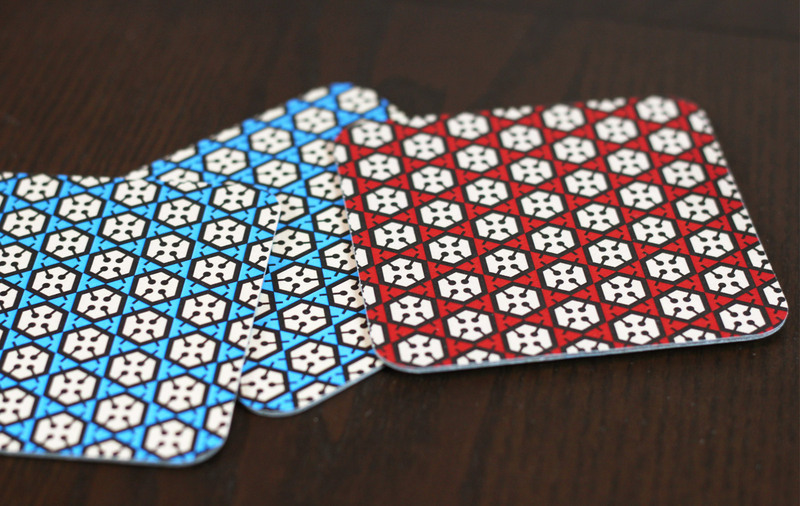 And there are some interesting designs on the back of the coasters, so… cool, I guess. The rules are simple enough, but the walls (and the randomization of them) makes each game a quick study in finding the most efficient path. Of course that can change based on your opponent’s moves, and that’s where it gets most interesting. Ideally, you set yourself up to make a series of jumps on your turn; that’s the easiest and most efficient way to get across the board. It’s nice that you can jump your own pawns, but it’s much better if you can jump your opponents as well. If you set your pieces up right, you can block an opponent’s jump, so then it becomes a quick jockeying for position to try and force your opponent to move a pawn aside to give you the jump. But, since the board is so small, you can’t spend a ton of turns running around trying to set up the position. AP is pointless. So, while the challenge and the interaction is there, the game keeps up since you’re better off just moving and blocking, and then sometimes you can sneak in an extra jump or find a slightly quicker alternate path. There’s no capturing of pawns, and no special moves. You’ve just got your pawns and a bunch of walls in the way. The randomized tiles are a nice little feature; not only does this allow the game to fit inside a very small box (what we around here like to call a “Lenny”), but it adds a little uniqueness to each game. You might have a setup that completely divides the board in half with walls, or you might have something where the walls are barely in the way, but maybe useful to try and force your opponent into an ideal position for yourself. The walls add just enough uniqueness to each game. And there are 12 tiles while only 9 are used, for a little extra variety. If there’s any downside to this game it’s just that there’s not a whole lot there. This is definitely a filler, through and through, but it’s not even as deep or interesting as many of the good fillers out there. You could play it with younger folk (I tried it out with my 8-yr-old nephew, who gave it the thumbs up) and it actually works well; due to the nature of the game, the end is always very close, unless someone does something intentionally silly. I suppose it’s the sort of game you’d pull out at a bar and play over a few drinks, but then I wouldn’t really know since I don’t go to bars. Here’s another picture of the game. It really is very minimal. 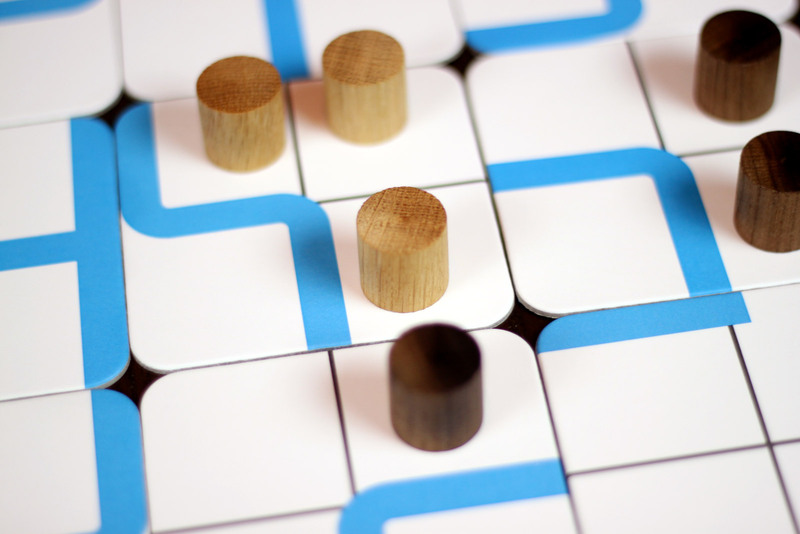 The design of the game is very neat; it’s a slick, clean abstract design, with clearly marked walls. Like the game, there’s not much to it, but it is simple, clean, and attractive. The tiles are made out of coasters, so I guess you could use them as that… but, I don’t know why you would. If you’re interested in a quick, lite, casual game with a clean design, that you can fit in your pocket, I can recommend trying Less out. It’s a fun little diversion, and I think it accomplishes what it means to. Check out the Kickstarter page and consider tossing a few bucks at it to get yourself a copy.